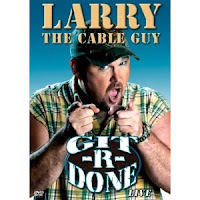 Larry The Cable Guy, a comedian from, I believe, Louisiana, has a take on comedy that stems from his blue collar view of the world. In his world, nothing is sacred. Wives, husbands, homes, dogs, kids and jobs; he goes after ’em all. But his motto, at the end of almost every joke is “Git R Done.” And that’s probably the best marketing advice anyone can give us. When I work with clients and lay out a marketing program along with to do action steps, assign responsibilities, timetables, write the copy, design the emails, update their website, provide them with Facebook posts, blog/newsletters, flier copy, telephone answering techniques, train the staff for inside sales and outside sales, I am sometimes surprised that during my follow up conversations I come to find out that they didn’t implement. Bottom line: It didn’t get done because Mr./Ms. Proprietor did not see it as a priority or if they did it became less important than flipping burgers because the snack bar girl didn’t come in. All too often it didn’t get done because the proprietor did not have the discipline to get it done or didn’t impart a sense of urgency upon his/her staff. And if building your business is not your priority, then what else is? Ideas with out action are worthless. Action without a plan is mindless. But planning with action taken will crush it…and make you money. So if you’re not there for the money (and the fun) what are you doing in that box anyway?